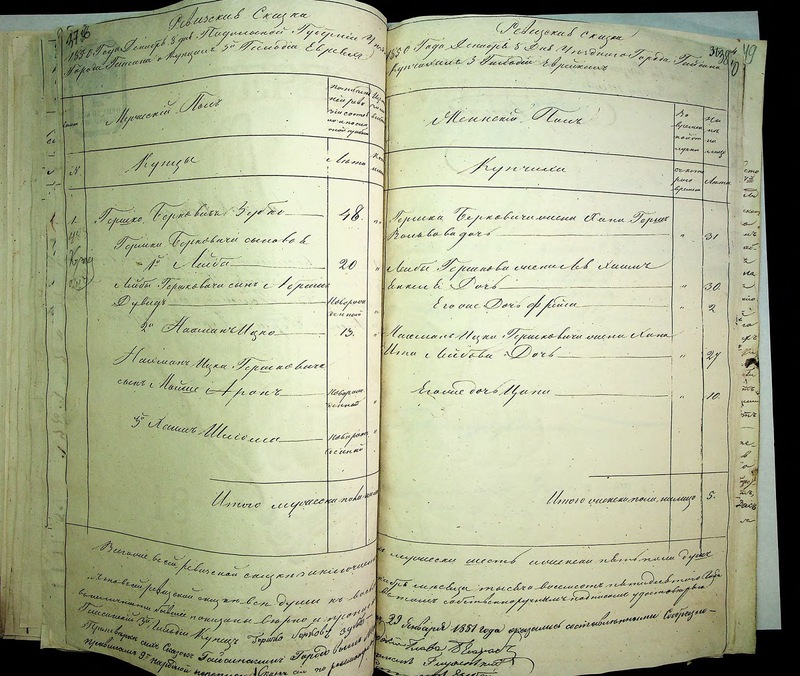 Last December, I wrote about how Alex Krakovsky was working to open up Ukraine's archives. In addition to suing (and winning), he's also made a page to put scanned documents from the archives online. No, they're not in English. But yes, they are awesome. More are being added all the time, so keep checking to see if your family's towns are represented. But in any case, I was looking through the list of scanned documents when I saw revision lists (censuses) from Haisyn/Gaisyn. My Zubkis family was registered in Kuna, just outside Haisyn, so I went through these. First I reviewed 158 pages of the 1851 census--and there was not a Zubkis to be found. So then I started on the the 92 pages in the 1850 census--and on pages 29-31, I hit the jackpot. Dec the 8th 1850, the Treasure House of Gaisin. This is the receipt to certify that the Treasury of Gaisin received 1 rouble and 80 kopeiks in silver from Gershko Zubko (Berko's son), third guild merchant. This sum represents the penalty for not filing his family information under the 9th census in time. I'm so thankful that Gershko didn't file his family information on time, because now I have all of this information! There was then a second cover sheet, which notes (thanks to Irina on the Genealogy Translations Facebook Group for this translation): "1850 December 8th Podolia Guberniya uesd town Gaysin about the family of the 3rd guild merchant (купец 3-й гильдии) Gershka Berkovich Zubka." Irina notes that "the 3rd guild merchant" in the Russian Empire is more than a simple tradesman. And then they get to the actual family members. This was a household headed by 64-year-old Gershko Zubka, son of Berko (the age "48" was from the previous revision, 16 years earlier). He was living with his wife, children and grandchildren. And he even signed the bottom of the page. I've seen another Gershko son of Berko before, but in another time and place. Berko Zibkis was a head of household in Uman in 1811. Among his children was a Gershko--as well as a Shaya, the name of my great-great-great-great grandfather. I was pretty sure that this was my family (and blogged as much when I discovered this 1811 census in 2015). But there was always a question in the back of my mind about why the family was in Uman in 1811 if they were later registered in the town of Kuna. But having a Gershko son of Berko of the right age in the town directly next to Kuna (in fact, when I was in Ukraine in 2016, Kuna had become part of Haisyn) where my Shaya lived and was registered gives me that one more piece of evidence that my family had lived in Uman, and that my 5th great grandfather was likely this Berko. This would mean that my Zubkis line lived in Uman, Kuna, Shpikov and Pittsburgh, all in a century's time! And it sounds like I need to head back to Ukraine for a visit to Uman. What a great service Alex is providing, and what a tremendous find. Congratulations!